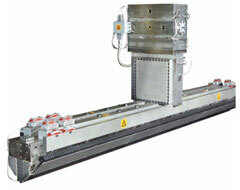 At the recently concluded K2013 show in Düsseldorf, Germany, global chemicals firm ExxonMobil Chemical was running its polymers on leading extrusion machinery, especially to showcase the benefits of using its Exceed and Enable metallocene polyethylene (mPE) resins to produce co-extruded film structures for demanding applications. 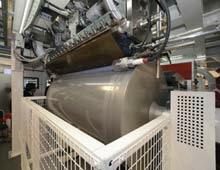 Windmöller & Hölscher KG Maschinenfabrik (W&H) – displayed the new blown film line Varex II running a five-layer, 40-micron collation shrink film based on Exceed and Enable mPE resins. Cloeren Inc. and W&H – displayed two NanoLayer cast stretch films: a 33-layer, 12 micron super power machine film for automatic wrapping and a 33-layer, 8 micron high tenacity film. Both use Exceed and Enable mPE resins and Vistamaxx (propylene-based elastomer) PBE. Hosokawa Alpine Aktiengesellschaft – showcased a fivelayer hygiene compression packaging film made with Exceed and Enable mPE resins. Guangdong Jinming Machinery Co. Ltd. – displayed a fivelayer collation shrink multipack display film using Exceed and Enable mPE resins. Torninova Corporation – showcased a three-layer, 12-micron cast stretch handwrap film using Exceed and Enable mPE resins as well as Vistamaxx PBE. Sun Centre Machinery Co. Ltd. – displayed a three-layer lamination film using Exceed and Enable mPE resins. 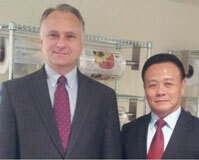 Lung Meng Machinery Co. Ltd. – showcased a three-layer collation shrink film using Exceed and Enable mPE resins. "Our collaboration with leading machine manufacturers is a unique opportunity to demonstrate our added-value polymer technology, combined with strong application development and the optimisation of processing conditions," says John Verity, Vice-President, ExxonMobil Chemical Polyolefins. A highlight at the show was W&H and US-based Cloeren Incorporated’s collaboration with ExxonMobil on the latest cast stretch film technology. The companies have developed and produced cast stretch films using NanoLayer technology, which is able to deliver up to 33 layers and a thickness down to 8 microns. Conventional cast stretch films typically have five or seven layers. While ExxonMobil provided its Exceed and Enable mPE resins and Vistamaxx PBE, Cloeren delivered its exclusive feedblock and die technology and W&H provided the cast stretch machine. One of the applications for NanoLayer cast stretch films is securing heavy load pallets. The films can deliver high wrapping speeds and excellent load retention, which can lead to more reliable shipping without load damage for products such as bottled water, soft drinks and other beverages. Sometimes a new technology can tie-in nicely together in a collaborative effort, if two companies have the experience of working closely together. While both Chinese extrusion machinery maker Guangdong Jinming Machinery and ExxonMobil have worked together for 13 years, the machine and resin technology has evolved over the years, and thus the new application on display. Jinming collaborated on a machine run with ExxonMobil, which is purported to lower costs and provide savings on materials. The company says it is probably the first OEM in Asia Pacific to offer this step-in solution for five-layer technology. “The synergistic relationship is a combination of the latest machine technology with the resin technology to enable source reductions for customers,” said Larry Gros, ExxonMobil’s Global Polyolefin Products Technology Manager. Jinming’s blown film machine was running a five-layer polyolefins structure for collation shrink multipack display film with ExxonMobil’s Exceed and Enable mPE resins. The shrink multipack display film included Enable mPE resin-based subskin sandwich layers and Exceed mPE resin-based outer layers. The Enable mPE in the core allows for high density, improved shrinkage and strength as well as downgauging, thus leading to more sustainable flexible film solutions. “The formulation on display is also designed for excellent optical properties and print surface for retail marketing as well as excellent sealing with easy cut-ability, making the films well suited for multi-pack bundling applications that require good optical properties,” said Gros. Meanwhile, Ma Zhenxin, President of Jinming welcomed the opportunity to work with ExxonMobil. “It is a nice opportunity and we look forward to future co-operation.” Ma also said that with the advancement of new technology, application areas are expanding. “One main goal of this collaboration is to better serve our customers,” he added, explaining that both parties will conduct joint trainings for customers on the use of the new resin/machine technology. The 35-micron collation shrink film is well suited for printed and displayed multipack bundling applications such as bottles and beverages, canned goods, hand soaps, detergents and health & beauty aids. The combination of machine technology with the resins offers benefits for converters, brand owners and retailers. Compared to conventional three-layer PE films, converters can benefit from higher productivity and greater flexibility to produce a broader range of film solutions from a single line. Brand owners can benefit from a source reduction in packaging materials and more productive operations with significantly more packaging impressions delivered per roll of film. Retailers can experience improved consumer attention to more appealing, high clarity packaging. The five-layer line is not totally new in the industry since barrier resins have been used before. But now five-layer dies for dedicated polyolefin blown films are being optimised for dedicated polyolefin film structures. The concept was first introduced at K2010. Today, this technology has advanced considerably as several customers are currently finalising formulations for commercial applications. He adds that the wide ranging capabilities of five-layer films using Exceed and Enable mPE resins and Vistamaxx PBE open new market opportunities, providing greater potential for a faster return on investment. Five-layer film formulations can deliver a balance of excellent optical and performance properties that is very difficult to achieve with conventional three-layer technology, explains Van der Sanden. A five-layer structure allows specific functionalities, such as sealability or optics, in each of the discrete layers. It also allows more control over the thickness of the layers to meet the needs of the application. For example, higher output can be achieved by using layers of high melt strength materials. While Gros agrees that the five-layer technology costs more due to two more extruders (compared to running a three-layer structure), he also says that the pay-off comes in using less resins with a payback in less than a year (for the incremental costs of a five-layer line versus a three-layer line). Adding to this Jinming’s Ma says that the industry trend is to upgrade from a three-layer to a five-layer line and customers were keen on reducing costs when presented with the lower use of materials. Ma also said that the firm had sold a number of five-layer lines based on the resin technology, after its showing at Chinaplas in Guangzhou this year. “Europe is leading in the upgrading of technology while customers in Asia are only just starting.” But Ma believes that it won’t be long before Asian counterparts see the benefits of a five-layer line and start upgrading too. 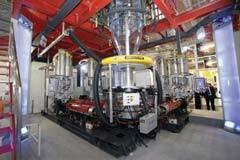 Meanwhile, Hosokawa Alpine says that its test centre in Augsburg, Germany, comprehensively tested the film structure developed in conjunction with ExxonMobil. The tests demonstrated that thinner hygiene compression packaging films are possible without compromising critical end-use performance properties. Even with the growing applications of five-layer polyolefins technology, three-layer structures are still a boon for reducing the usage of raw materials, especially for cast stretch films. The Compact Stretch 1,000 three-layer cast stretch machine, with three extruders is designed for in-line production of hand, machine and jumbo roll formats due to its all-in-one winder model Quickgold-3S. This technology allows high production flexibility with changes from a 9-12 micron film to a 17-23 micron film in a reportedly very short time without interruption. Scrap rates can also be low. “With producers of stretch films facing increasing costs of raw materials, labour and energy, profitable production may only be attainable with a system that allows elevated and continuous production, 24 hours a day,” said Riccardo Marsili, Chief Technical Support Officer, Torninova. Another demonstration by Chinese machine maker Lung Meng Machinery for collation shrink film allows for flexibility, since the three-layer co-extrusion line can be configured to meet customers’ needs, with a film width of up to 1,750 mm and an extrusion output of 450 kg/hour. Richard Chen, General Manager of Lung Meng says that the tough collation shrink packaging film can provide opportunities for downgauging, as well as offer high transparency for outstanding aesthetics. Meanwhile, compatriot Sun Centre Machinery demonstrated a three-layer blown lamination film with a maximum width of 1,650 mm and a extrusion output of 400 kg/hour. “The combination of ExxonMobil’s mPE resins and Sun Centre’s machinery technology delivers clear, tough lamination packaging films,” said Amy Zhao, Assistant to the General Manager. In addition, she said it offers outstanding sealing performance and high, consistent tear strength, thereby allowing for downgauging opportunities.